Rum with fruit and pumpkin for the holidays! No Thanksgiving would be complete without pumpkin in some form. Fortunately we use thsi noble squash for more than pies or the Halloween jack-o-lantern. So why not introduce pumpkin to our cocktail glasses? Pumpkin liqueur married with the rich and seductive flavors of aged, dark Rum and a refreshing splash of pomegranate juice conspire to create a cocktail worthy of the holidays. In a cocktail shaker add the Rum, pumpkin liqueur, and pomegranate juice. Top with cubed ice and shake vigorously for 10 seconds. 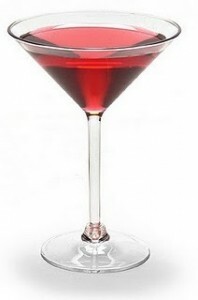 Strain into a chilled cocktail glass that is rimmed with raw sugar (optional). To rim the glass with the sugar wet the rim with a lime wedge. Dip the wet rim into a bowl or plate of raw sugar to give a modest coat of sugar. We like to add sugar to half of the rim leaving the other half clean.